The Intro: Thank you for having me. I really appreciate the opportunity to discuss this project with you and all the foosball.info visitors. Answer: I began foosing around three years ago. A friend and myself were at a local pub and after playing for a few nights I finally hit the ball hard (thanks to a quick tutorial on the roll-over shot) and I have been hooked ever since. I graduated from the University of North Texas in Denton, Texas with a Master's of Journalism degree and then worked as a photojournalist for around six months. Prior to that, I had done some video work in college in addition to multimedia documentaries. As my addiction to foosball grew, so did my interest in documentaries. The movie was a perfect match for both interests. I still live in Denton, TX with my girlfriend (Jodi), our dog (Beau) and our cat (Foos). 2. When and why did you decide to work on this documentary on foosball? Answer: A few months after I had started playing foosball, I heard of a big money tournament in Austin, TX. That was my first experience with professional players. I watched a match featuring Johnny Horton and Dawn Swan and this was the genesis of the documentary. They are two of the more colorful and excitable foosers of recent history and their intensity aroused my curiosity. Then I saw foosball trading cards. I thought there must be a lot more to this foosball thing. I put it on the backburner for almost two years, and then finally began the project in March of 2003. 3. 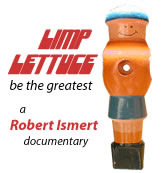 Is the title of your documentary "Limp Lettuce" - Be the greatest? Er... could you elaborate on it? Answer: When researching the documentary, I was loaned dozens of old Foos Noos and Table Talk newsletters from the 1970's and 80's. As I browsed through a 1977 edition, I came across an article about "Foosball Handshaking". It described some of the different types of handshakes that players can use to express themselves after the match. "Limp Lettuce" is the 1970's equivalent of the "dead-fish" used today. It is basically a way to show disrespect to the other fooser after a match. After finishing the article, I thought it would make a great title for the movie. 4. Is there a message(theme) you hope to get across to your viewers? Answer: I attempted to create a movie in which the fall, redemption and temptation of man is examined through the "eyes" of foosball. Foosball can become very addictive and can lead to euphoria. Conversely, it can lead depression and the struggle that accompanies the feelings of lose and hopelessness. The game itself is still striving at redemption in many ways. Foosball exploded in America during the mid 1970's. Big money tournaments. Porches and Corvettes were given away. At one time it was the 8th largest sport in the world. But as quickly as it grew in America, it collapsed even quicker. And whether it is a promoter, player or manufacturer, foosball has many individuals that are still striving to redeem themselves or the sport for personal or professional failures that may have been either self-induced or simply circumstantial. Much the same way as the game itself and the factors that contributed to the collapse of the Tournament Soccer machine in 1981. Promoters attempt to reverse the image of foosball as simply a drunk, bar game. Players attempt to recapture their greatness. Tragically, futile attempts at loving and redeeming each other are part of foosball and the players. Hopefully, I have put the movie together in such a way as to allow the viewer to decide whether or not redemption is within reach, or even worth pursuing in some cases. 5. What was your impression of foosball and foosers in general before making this documentary? And has your impressions changed after making the documentary? Answer: I don't know what I was doing as a child, but I never thought about or played foosball until I started playing around three years ago. I grew up near Dallas during the 1970's, which at the time was the hotbed of Tornado foosball. But I guess since there wasn't foosball in Star Wars, I didn't notice any foosball machines. I have loved foosball and foosers since day one. The learning curve has been so erratic for me. I love the game. I hate the game. I love the game. I hate the game. That is part of the reason it is so attractive. And every fooser I have ever met loves to talk the game and are generally great people when at the table. If anything has changed since I began this project, it would probably be that my love for the game has grown ten-fold. It's like my girlfriend in a way. I have loved her for a long time, but as I learn more about her, that love seasons my soul and becomes embedded. The more I learned about the history, players and passion of foosball, the more it has become part of my life. It is a family in every sense of the word. I think foosball has always been great. If people haven't been exposed to it properly, a misconception of what it is and who plays the game may be present. That's an unfortunate part of the game and a byproduct of where it is primarily played in the United States. 6. What do you hope will be the foosers' reaction to your documentary after they have viewed it? Answer: I'd like for any fooser that watches the movie to leave the theater feeling as if they just went deadman on meat-nut at the World Championships for ten-grand. Hopefully, foosers will take away some of the history of the game and gain or deepen an appreciation of what it takes to become a World Champion or promoter or fan of the game. The dedication that some of the people involved in the sport have is tremendous. Hopefully it transfers well to the screen and inspires foosers and non-foosers alike to become more involved in the sport. And strive to "Be the Greatest" at whatever they do. 7. I am sure you have interviewed a lot of professional foosers... :-) Can you tell us, in your opinion, who are the most memorable and passionate ones and why you think so. That's another great aspect of foosball. There is an abundance of interesting people in the game.Â Todd Loffredo is the wise, "Yoda" figure still capable of amazing things.Â Steve Murray is the father-figure nurturing and caring for the foos family.Â Bob Furr (inventor of the Tornado table) is the analytical, logical engineer returning to the game after many years and discovering the fate of his invention.Â Scott Moreland is the grinder that still plays 5 days a week and hasn't missed a tournament in countless years. I could go on, but the most engaging person I interviewed was Johnny Horton.Â His passion for the game in addition to his unique ability to translate that passion into words and emotions on camera is unmatched in the movie.Â And he has experienced quite a roller coaster of a ride in his foosball career that is quite interesting as well. 8. When will Limp Lettuce be released? And where? Next year, I will be entering the movie into film festivals. I don't anticipate it being released in theaters. If accepted into festivals, it will be playing in those cities. As far as distribution, I don't have a timeline. If I had to guess, I would say by the middle or end of 2005 DVD's should be available. 9. Any chance of Limp Lettuce being shown on Discovery Channel or National Geographic? As far as television, that depends on the channel. If a company notices the movie at a festival or elsewhere, they may offer to show it. But I am not really sure how this process works. Perhaps PBS can sandwich the documentary between "Flight of the Wildebeest" and "Zoboomafoo". 10. What are your plans after the release of Limp Lettuce? Win the World Championships of course. I've talk to the best. Seen the best. Now it's time to be the best! Well, maybe I'll just enter the World Championships and see what happens. I've been working on my pull. I'M GOING LONG!